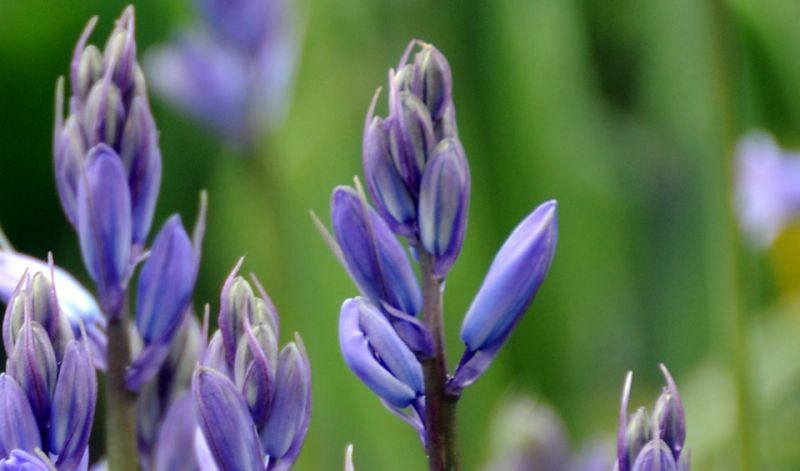 Similar to H. hispanica but these scilla do not grow as tall and bloom a bit earlier. Another notable difference is that the flowers bloom all on side of the flower stalks which bend nicely into that direction. In borders, rock gardens, perennial beds and woodland areas. Unless you want the plants to self-seed (which they do quite readily) remove the flowerheads after flowering. If you want them to bloom again next year the foliage must be allowed to die back on its own and will require consistent moisture while it does. (Some companion perennial plants like ferns or hostas will hide the dying foliage well). Once the clump becomes overgrown you will notice that it will produce fewer and smaller flowers and weaker and smaller leaves. Simply dig up the bulbs when the foliage has almost died down. Divide, respace and replant them right away and they are good to perform for another 3-4 years. Formerly known as Scilla. The hispanica species are native to the Iberian peninsula, the non-scripta species to North-western Europe.